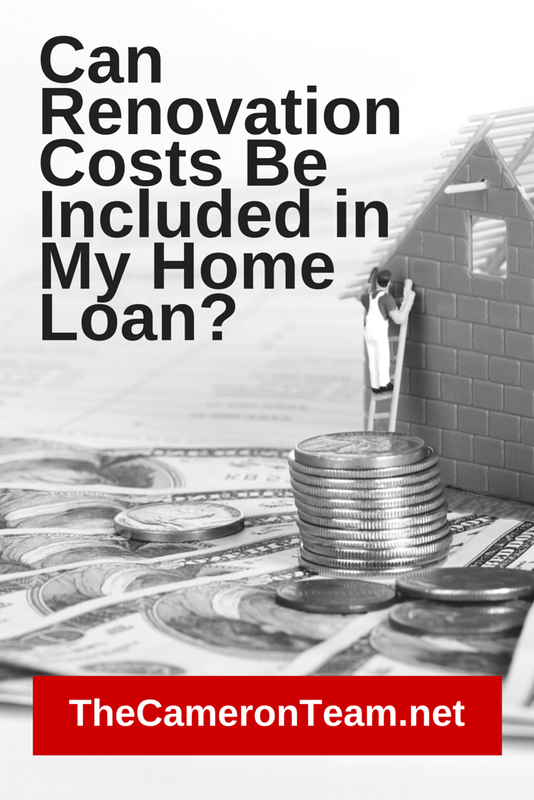 Can Renovation Costs Be Included in My Home Loan? You want to buy a home that needs some work, but you aren’t quite sure you can afford all those upfront costs. What can you do? Apply for a FHA 203K Loan! An FHA 203K is a loan that allows you to bundle repair/renovation work and the purchase price of the home. There are two types. The first is called a Standard Loan. It’s for more complicated projects, like those that require structural work – room additions, wall removals, substructure improvements, grading and landscaping, etc. or anything that will make it impossible for you to live in the home for some time. The second loan is called Streamlined. This covers all work from kitchen and bathroom remodels to roof and window replacements. It also covers septic systems, lead-based paint issues, and making a home more handicap accessible. It can be used in conjunction with an Energy Efficient Mortgage (EEM), which allows home buyers to add energy efficiency features as part of their FHA purchase or refinance. Who Qualifies for a FHA 203K Loan? Owner-occupants, government bodies, and non-profit organization can qualify for a FHA 203K Loan. Investors cannot. The down payment, credit qualifications, loan limits, etc. are the same as an FHA mortgage. You’ll have to check with your lender on the details at the time of application. In addition to that, you’ll need to provide a detailed explanation of the repairs to be done, including a cost estimate from a contractor. So, expect to do a good amount of legwork prior to finalizing financing. Who Does the Work for a FHA 203K Loan and How Do They Get Paid? The homeowner is only allowed to do the work on the property if they’re a licensed professional. Otherwise, they must hire a contractor to do the work. If they do qualify to do the work themselves, they will not be paid for labor, just cost of materials. Once the home is closed on, the money for the renovations is put into an escrow account and is paid out as phases are completed. The final payment is paid after a final inspection of all the work completed. The exact schedule of payment is determined by the lender. Renovations on the home must begin within 30 days of closing and must be completed within the timeframe specified in the mortgage agreement. This is typically within 6 months. If not, you may be considered in default. What if I Can’t Live in the Home While Work is Being Completed? If you are unable to live in the home due to the renovations taking place, up to 6 months of mortgage payments can be included in the Standard FHA 203K Loan. Renovations that do not allow habitation will not qualify for a Streamlined loan. So, if you’re looking to purchase a home in need of some rehab/renovation work, you have an option! Guidelines and requirements can change, so you should always speak to a lender specializing in FHA 203K Loans before you make any decisions about buying. If you are in need of one local to the Wilmington area, give us a call or send us a message through our Contact page. We’d be happy to refer you to a reputable lender.